After we found the cherry trees, I had a better understanding of how the map worked, so we decided to backtrack to the Polaroid house. We had no idea what the Polaroid house was, or why were were being sent there, which is why god made the iphone. The house is on the south side of 138, overlooking Quail Lake near the turn off for Ridge Route Road. It’s a small abandoned house, with the three front steps missing, the front door missing, windows shattered, graffiti on the broken plaster and no Polaroids on the floor. I have no idea why it is that abandoned houses are so interesting, why we find them so exciting and strange. Is it a sense of history? Is it just looking at something decay? Or just the idea of death? But then again it might be the graffiti left in the bathrooms. 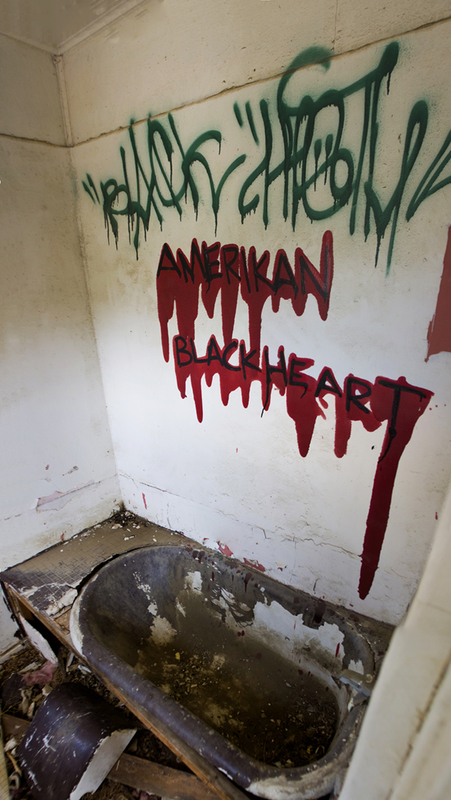 Amerikan Blackheart graffiti, dripping fake blood, painted on the wall of an abandoned house, also known as the Polaroid House, overlooking Quail Lake on route 138. 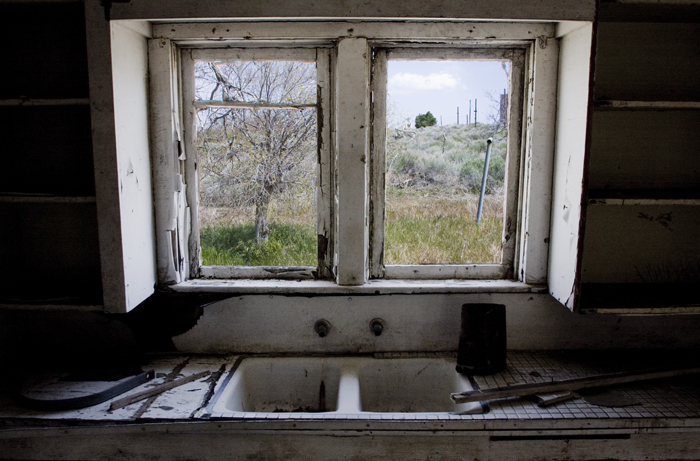 Looking out the kitchen window of the Polaroid house -with no Polaroids- into the remains of a garden, overlooking Quail Lake on route 138. 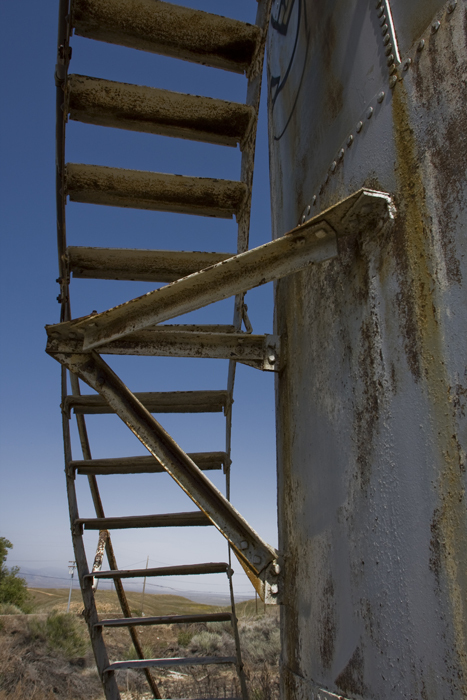 There is an abandoned water tower -I assume it is a water tower- near the Polaroid house -that has no Polaroids- with steps rounding the tower to the top, near Quail Lake on route 138. This is when a convoy of cars arrived, parked and a gluton of people came climbing over and around the abandoned house with us. It was the Midnight Riders. They were even later than us. We talked, discussing cameras and abandoned houses. After a few moments of waiting for the group, we decided, that since we had already visited the cherry trees, we would continue on with the tour by ourselves, and maybe meet up with them later. The next stop on the trip was a crack house, and knowing the Midnight Riders, it was probably a real crack house. We missed the turn to visit the crack house, so we decided to not backtrack, and just keep moving forward. Next was the Arthur B. Ripley Desert Woodland State Park, between 210th St and 200th St on Lancaster Rd. It was full of Yucca trees. Strange growths and arms, ending in flower like groups of green spines. 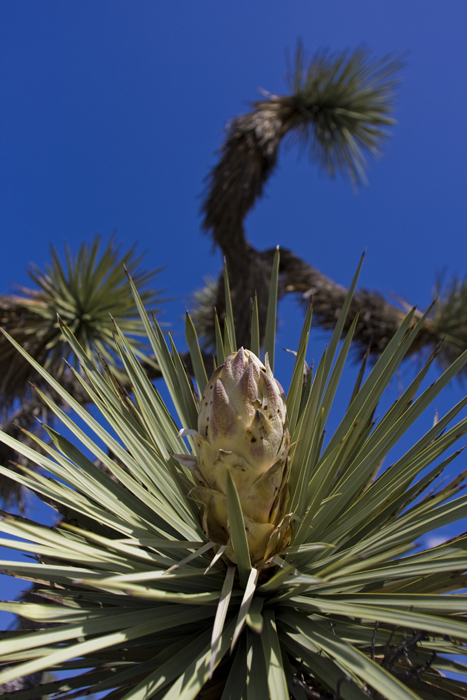 A Yucca tree in the Arthur B. Ripley Desert Woodland State Park, near the town of Lancaster. The next stop was some chicken coops by the side of the road, which we couldn’t find, so we continued along to the poppies. 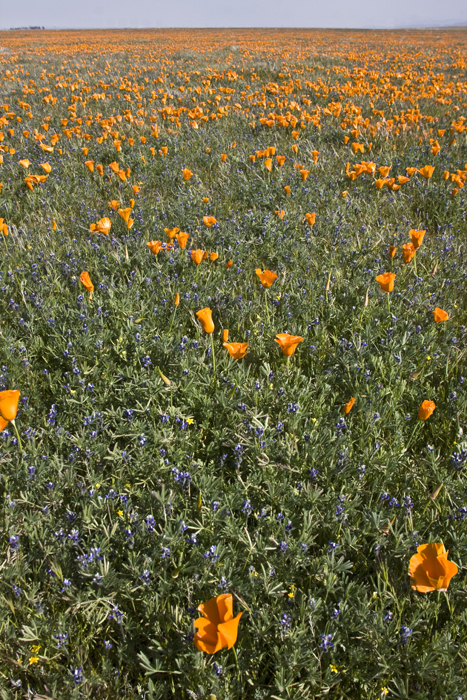 The Antelope Valley Poppy Reserve Park is just off Lancaster Road at 150th St, but the poppies are scattered all across this area. We found ourselves arriving from the north, on Route 138, also called Avenue D. The low hills and the green fields covered with orange poppies were to the south, so we took a dirt road, with a sign saying that it was 130th St, and headed off into the fields. On either side of the dirt road were orange fields, where the poppies stretched almost to the horizon, broken in the hazy distance by electrical wires. 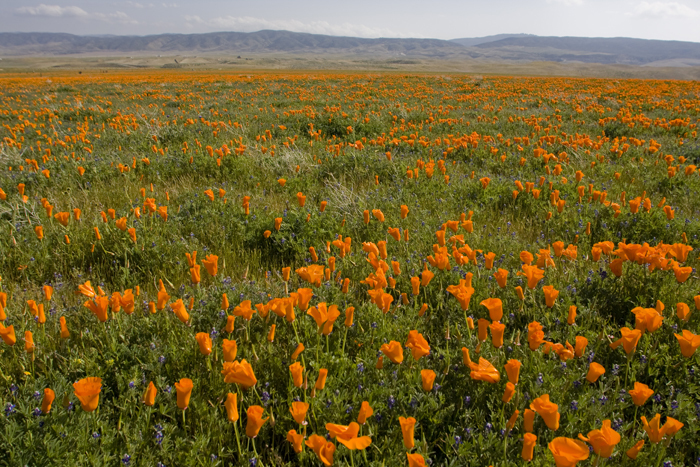 The poppy fields near Lancaster at the The Antelope Valley Poppy Reserve Park. Continuing south on the dirt road, we climbed over the small hill, and followed the dirt road both south and west until we came to the groups of people clustered near the official place to see the poppies. This time the poppies stretched almost to the horizon, broken by the mountains to the south. After stopping at In-n-Out, an antiques store, and a closed open air museum with a U-2, Blackbird, and a Nighthawk sitting under the darkening sky. We drove back home by the 14 freeway, knowing that this tour was exactly what I needed.